After a Chain with 3 or more Links resolves, draw 1 card. This effect cannot activate if multiple cards/effects with the same name were activated in that Chain. Iris, the Earth Mother is a Level 6 Light Fairy-type monster with 2400 Atk and 1200 Def. 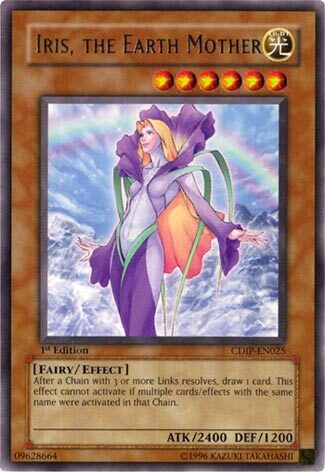 I’ve always thought of this card as the mother of Agent of Mystery Earth. That card is good while this one is not. It’s basically just a vanilla with 2400 Atk. If you happen to have her on the field when a chain with 3 or more links resolves you can draw one card. All the links must have different names. At least this can resolve more than once per turn, but it’s just not worth it. Chains got more support later on, but this doesn’t do enough. Mom’s need better cards. Another day, another Mother and this time the Mother of… the Earth I guess. The next Mother to be reviewed is Iris, the Earth Mother. Iris, the Earth Mother is a Level 6 LIGHT Fairy with 2400 ATK and 1200 DEF. Stats are acceptable on a Level 6, a little better than yesterday. LIGHT is one of the best attributes in the game and Fairy is well supported. While Iris is on the field, when a Chain Link of 3 or higher resolves, you draw 1 card. This card cannot activate if multiple cards/effects with the same name were activated, so no using three Mystical Space Typhoons. I guess this restriction could of been necessary to make this harder to resolve so you can’t draw too much, but Iris is already a Tribute Monster that has no real capability of being searched. This is a prime example of what they tried in Cyberdark Impact, Chain Links and columns. Now Chain Links did work as they got later support, but it wasn’t because of Iris, the Earth Mother. Art: 4/5 She is pretty, I’ll give her that. Now here’s a card with some potential, if only for the Counter Fairy Deck. This is probably the best of the jank we’re reviewing this week. Light, Fairy, Level 6, this time with the norm of 2400 attack. After a Chain of 3 or more Links resolves, Iris lets you Draw a card. In Counter Fairies, this can be done somewhat easier than some/most Decks. You can’t use multiple cards of the same name in the Chain, but I suppose that’s necessary, so we didn’t break open some Turbo Draw Engine. Much like yesterday, there are better Fairies out there, but unlike yesterday, there are far worse ones too. Next articleYCS 200 at Mexico City, Utrecht and Columbus!